Whether and when he lived is unknown. 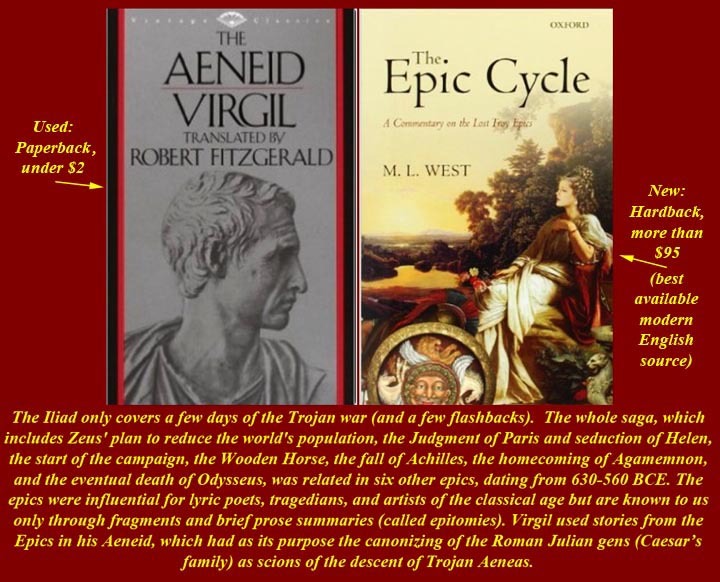 The Epic Cycle (Greek: Ἐπικός Κύκλος, Epikos Kyklos) was a collection of Ancient Greek epic poems that related the story of the Trojan War, which includes the Cypria, the Aethiopis, the so-called Little Iliad, the Iliupersis, the Nostoi, and the Telegony. Scholars sometimes include the two Homeric epics, the Iliad and the Odyssey, among the poems of the Epic Cycle, but the term is more often used to specify the non-Homeric poems as distinct from the Homeric ones. Aside from the Odyssey and the Iliad, the cyclic epics only survive in fragments, the most important of which is a detailed summary written by someone named Proclus (not the same person as the philosopher Proclus Diadochus). 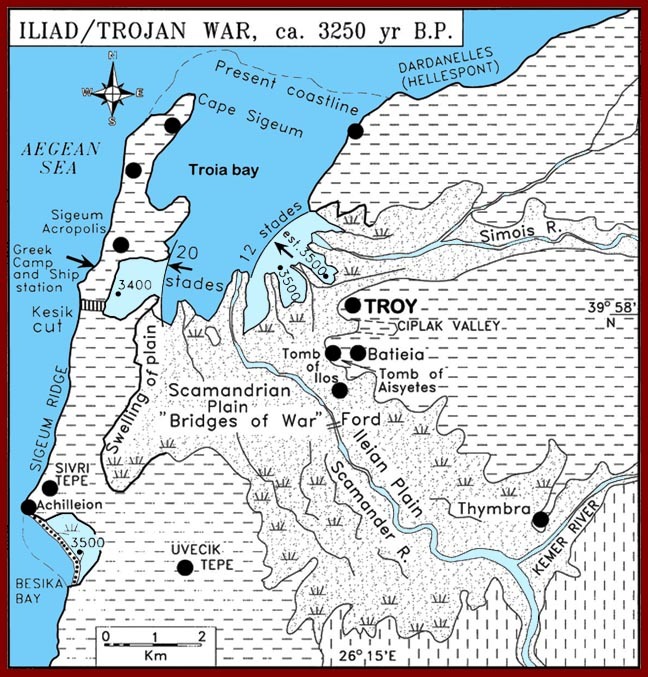 Homer's Iliad is only a small part of the corpus of information about the Trojan war -- it covers about four months of the tenth and last year of the war. 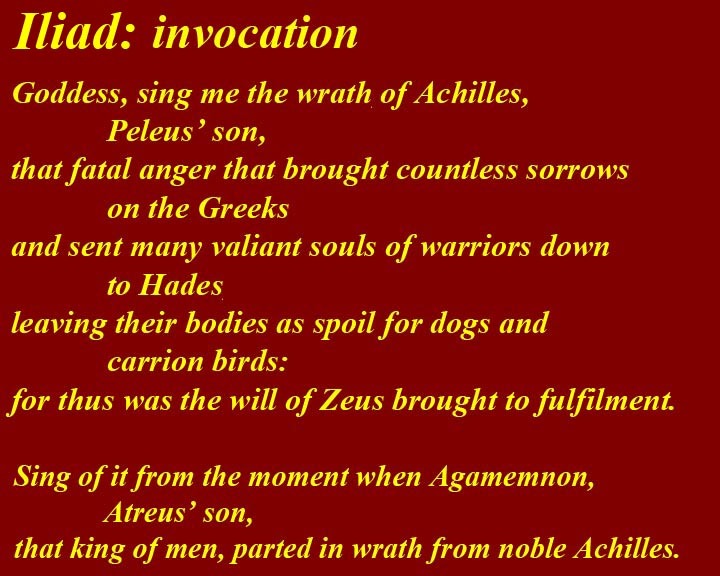 The first few lines of the Iliad, called its invocation, makes clear the idea that the Iliad is not about the war but about the dispute between two of the Achaeans, Achilles and Agamemnon, and what effect that dispute had on the last year of the War. The great prize the two "heroes" fell out over was a captive woman, Briseis, who Achilles was awarded after he killed her family. 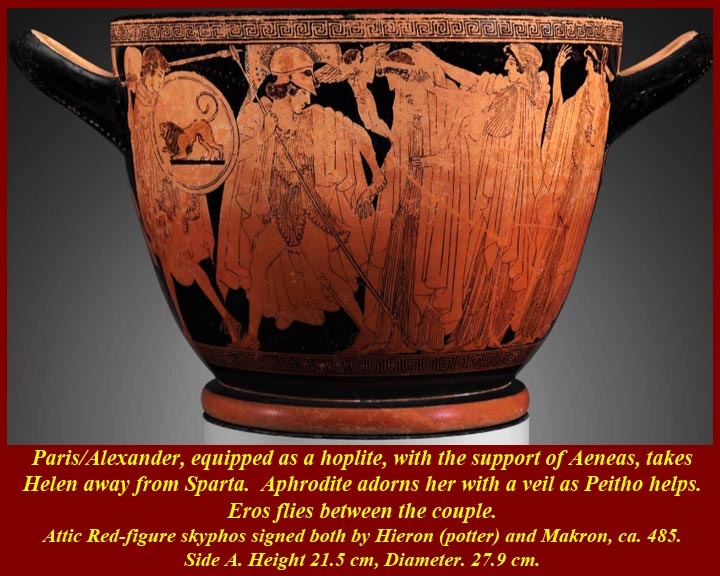 Agamemnon had captured another girl Chryseis (later Cressida), but Apollo fancied her and took her From Agamemnon. 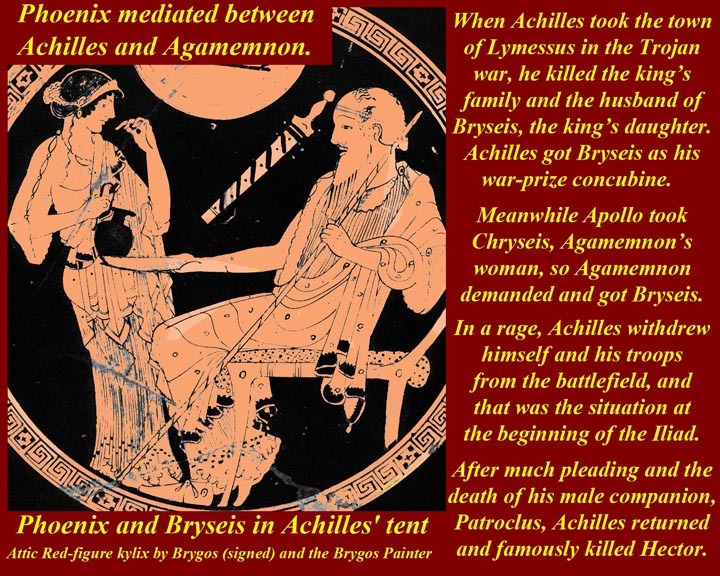 Agamemnon, of course, pulled rank and took Briseis, and that caused Achilles to withdraw in a rage to his tent. 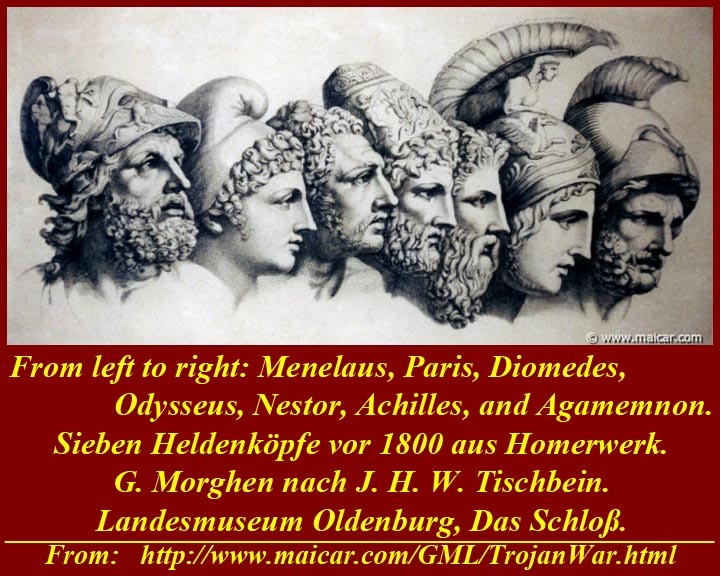 Neither he nor his myrmidones would fight, and that is what "sent many valiant souls of warriors down to Hades." 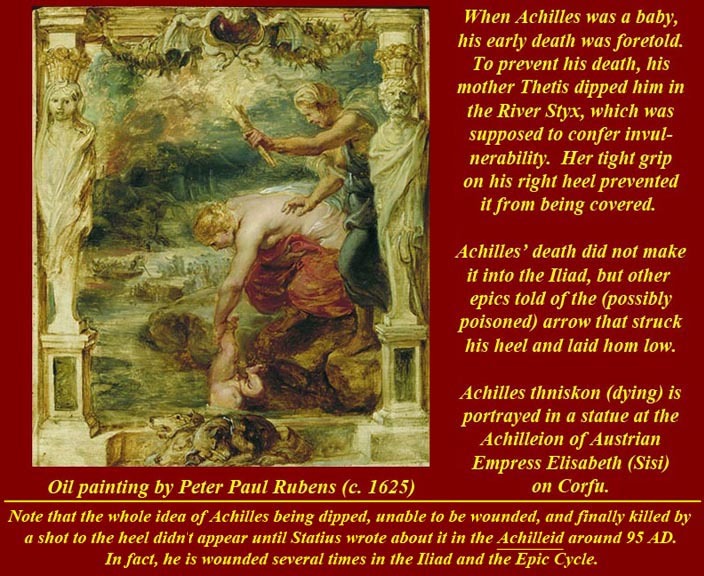 It has also been suggested that Achilles was still trying to avoid the early death that was prophesied for him. The image shows Bryseis with Phoenix who tried to mediate the dispute. Phoenix was a kindly old warrior, who helped raise Achilles while he himself was still a young man. Achilles deeply loves and trusts Phoenix, and Phoenix mediates between him and Agamemnon during their quarrel. 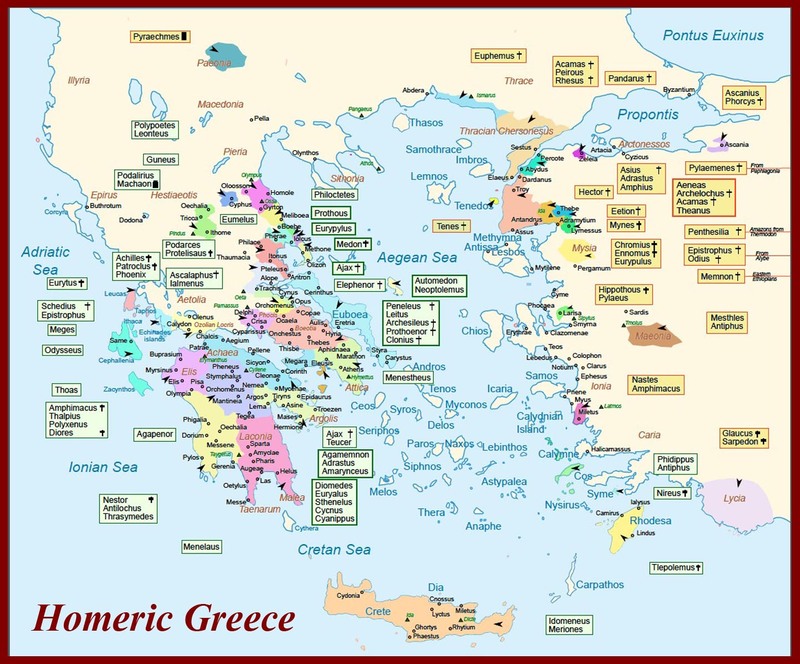 The Map shows the places of origin of personages and groups that appear in Homer's Iliad. The field of action in the Trojan War. 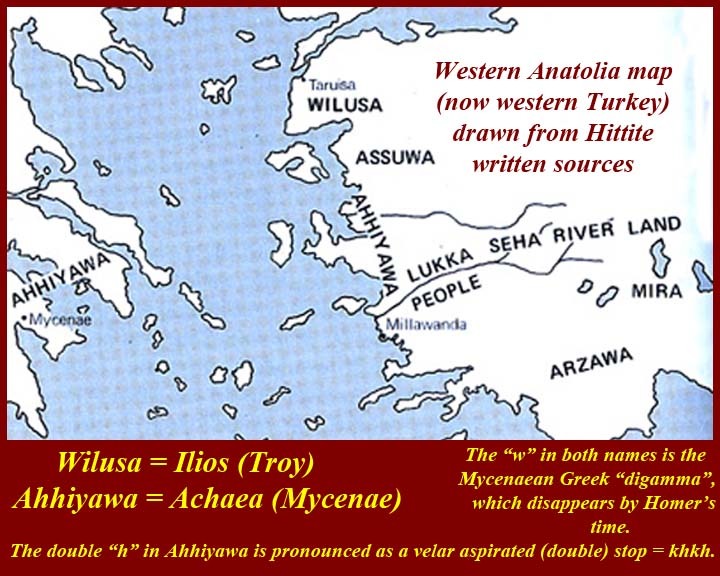 Note the position of the shoreline now and in the 1200s BC. 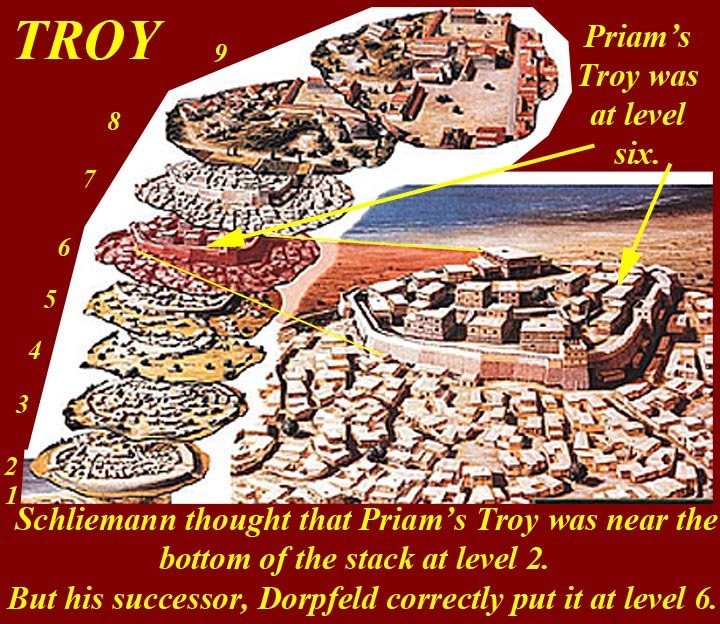 Dorpfeld correctly put Priam's troy at Level VI and said that there was evidence of earthquake damage. 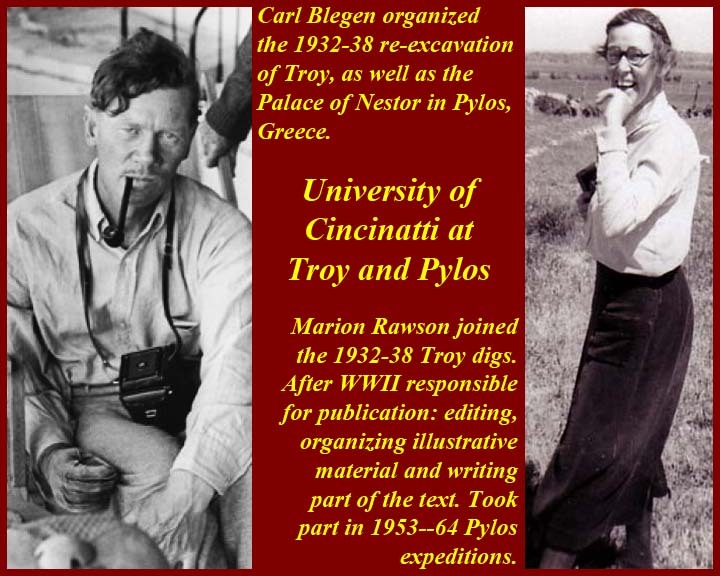 Blegen and Dawson agreed that VI was damaged by quakes and that VIIa was destroyed by war. 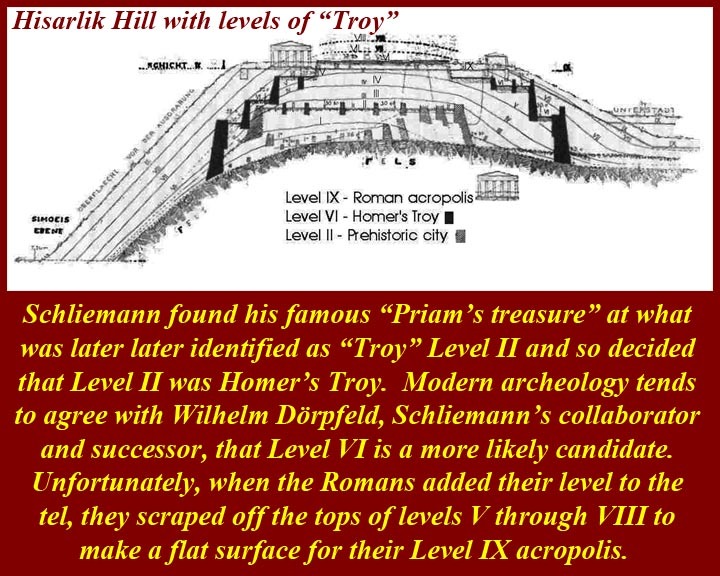 Later excavators have placed what previously was counted as VIIa as VIi, a second phase of destruction caused by war. 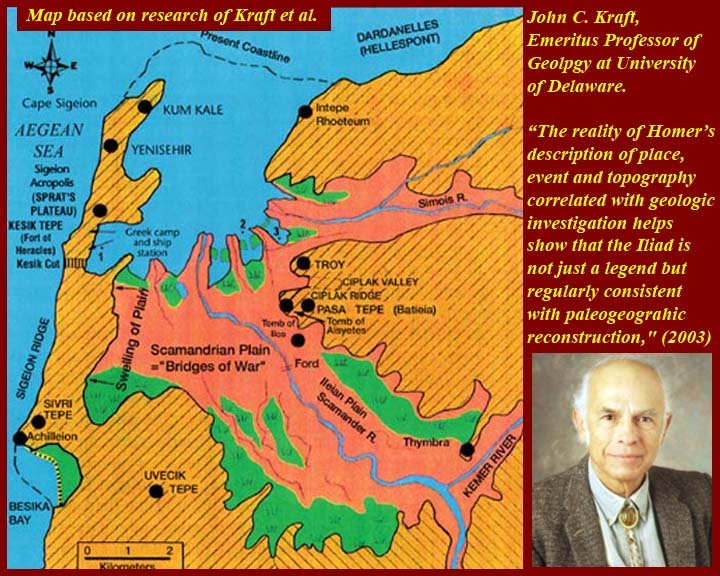 Kraft, a paleogeologist determined more clearly the ancient shorelines. 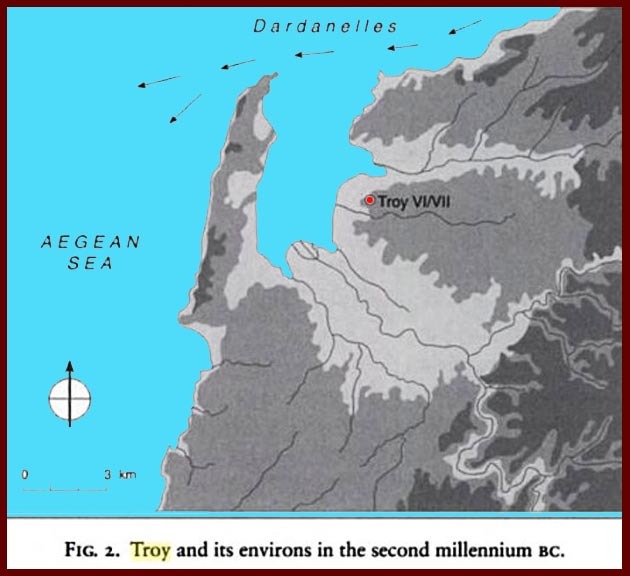 The environs of Troy in the 11th Century BC and the Troy Archeological park and environs today. 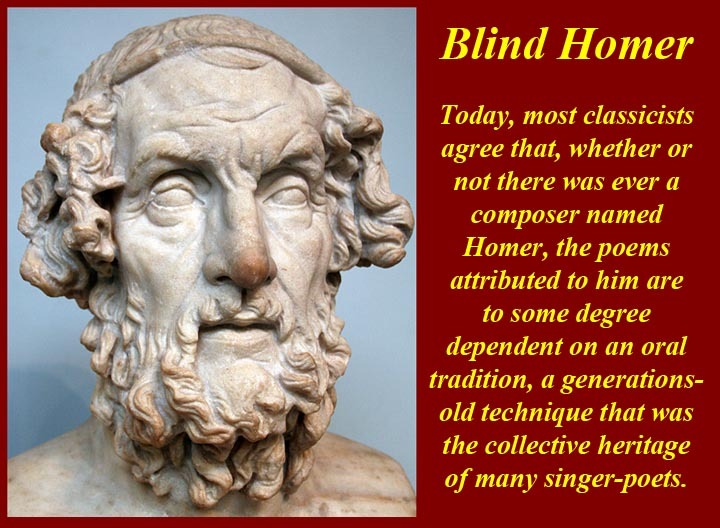 Homer might never have existed, but if he didn't, his two great epics reflect the poetry of someone else known as Homer. (That's an old joke attributed to many different pundits.) 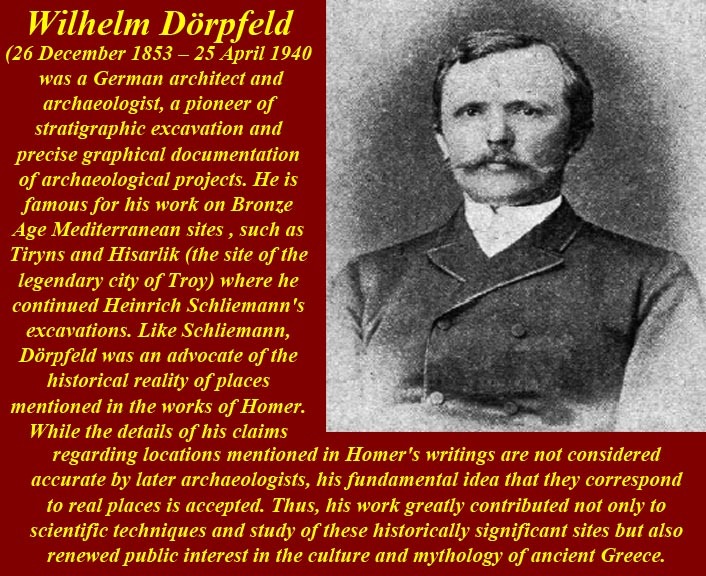 See https://en.wikipedia.org/wiki/Homer for more info on the supposed poet/singer/epicographer supposedly known as Homer. Probably the most canonical translation of the Iliad is the Loeb (A.T. Murray), which has facing pages in the Greek and in English. The Loeb is used in classics, language, and archeology course at universities. The English might feel a bit stilted to casual readers, because, to some extent, it follows the Greek grammar, which casual readers are not expected to know. The Murray translation is also available on the Internet at https://en.wikisource.org/wiki/The_Iliad_(Murray). If you want hardback Loeb volumes of any of the classics, you can usually get them on the internet at on line book sources. 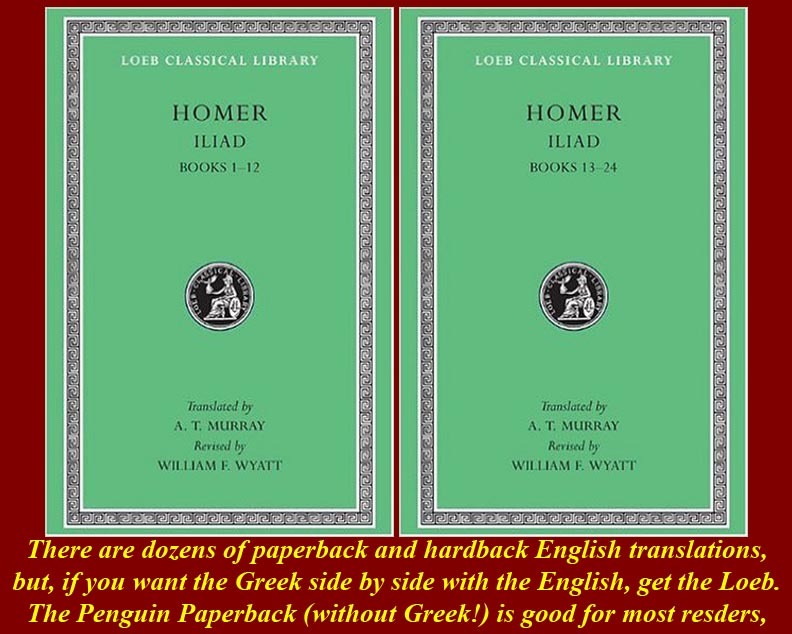 The most popular and affordable translation of Homer's Iliad is still the Penguin Paperback (Robt. Fagles). 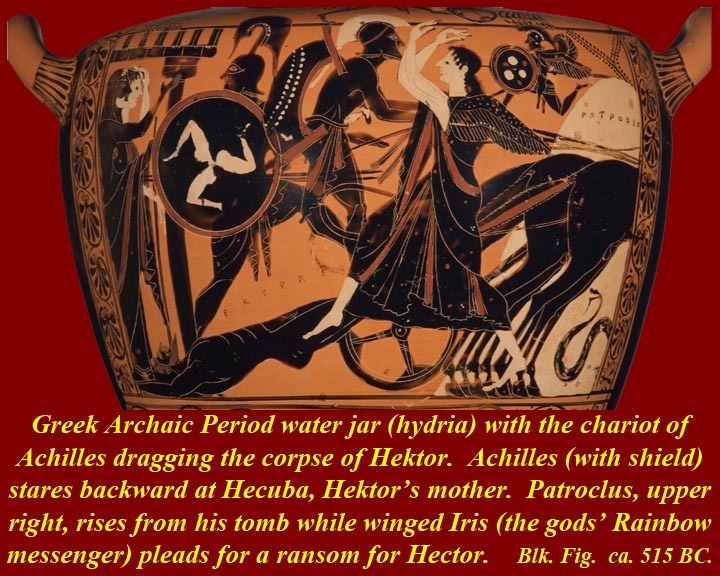 The rest of the Trojan War story comes from the "Epic Cycle", six now lost Greek epics that apparently were put down in writing in the seventh century, although, like Homers poems, the may have been sung for many years -- maybe even centuries -- before. 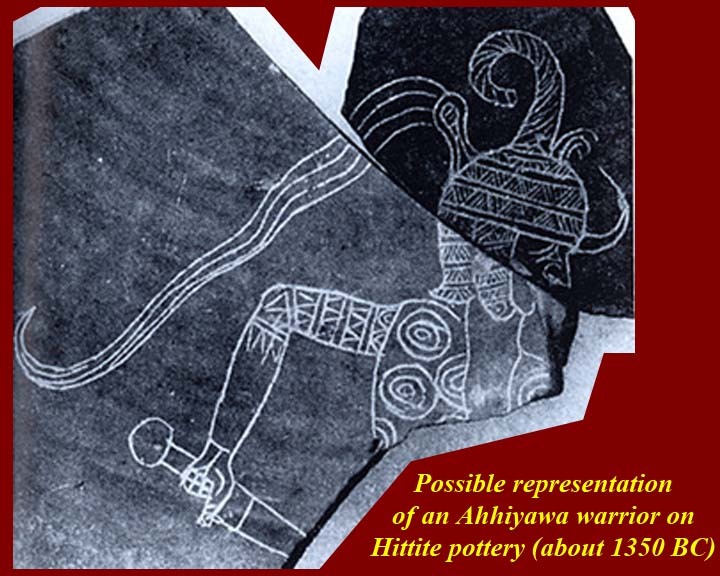 Although the epics of the cycle are long gone quotes and epitomes of the epics tell us what they said. Virgil's epic, the Aeneid, puts a Roman and pro-Julian spin in the story by telling the tale of the escape of Aeneas and his followers from Troy. Signifficantly, it adds th the name of Ascanius (son of Aeneas) the descriptive name Julis (meaning "from Ilion" = the Trojan and posits Julis as the founder of the Roman Julian (Later Julio-Claudian) gens, thereby entering Venus (Aphrodite) into the ancestry of the Julians. The Gens Julia also claimed descent from Mars, who, according to myths, impregnated Rhea Silvia (AKA Julia), the result of which was the birth of Romulus and Remus. 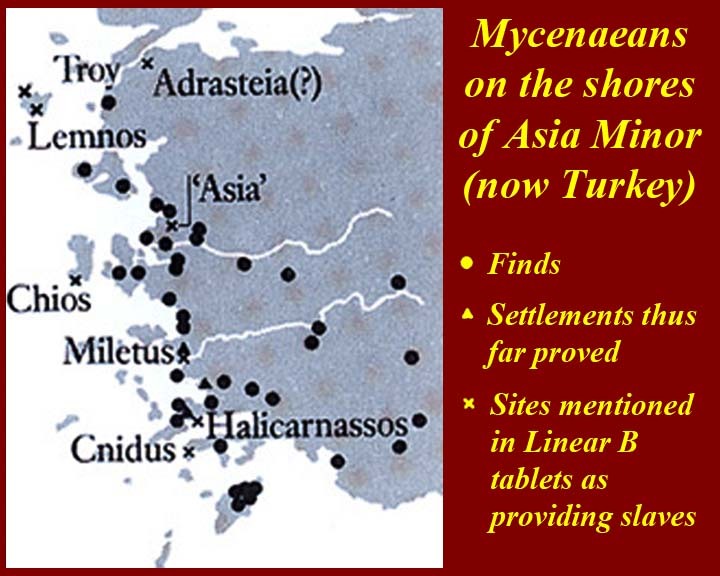 Places in Asia Minor where evidence of Mycenaean presence was found. 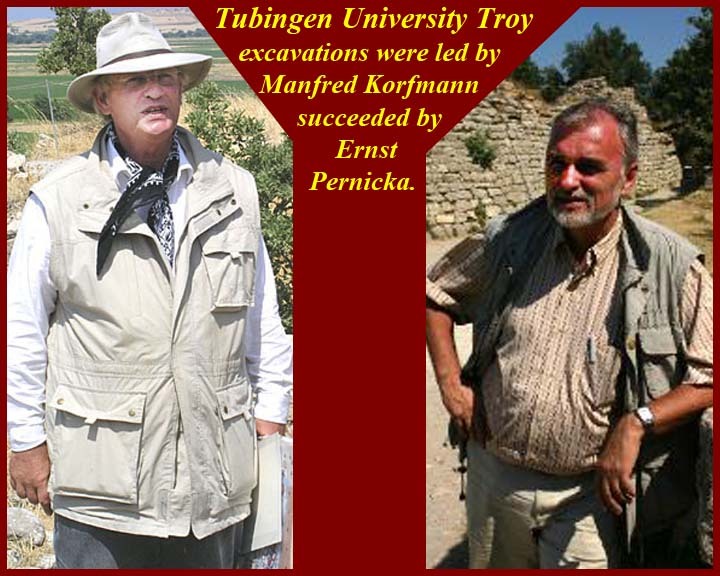 Physical remains of Mycenaean presence abound in western Asia Minor -- Turkey -- both in the form of pottery and artifacts and in the form of instruments of war in destruction levels, including Troy VIh and VIi. 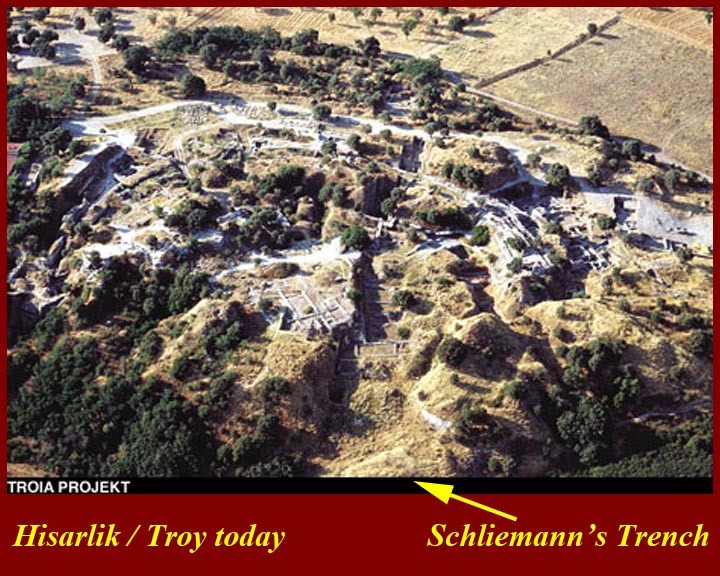 After the destructions there is further architectural, artistic, and domestic evidence of Mycenaean influence. 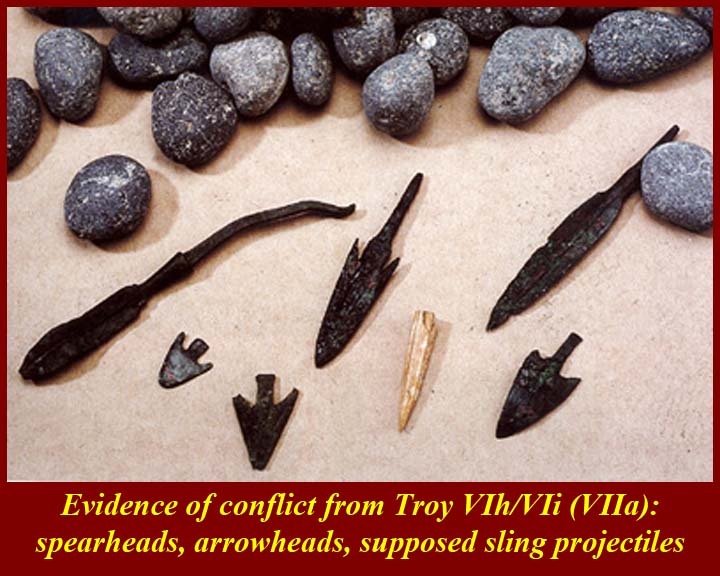 Some experts say, however, that some of the evidence may merely be indications of known trade patterns and cultural influence and borrowing. To some extent, all of this could tie in with the beginning of the Eastern Mediterranean "Dark Age". 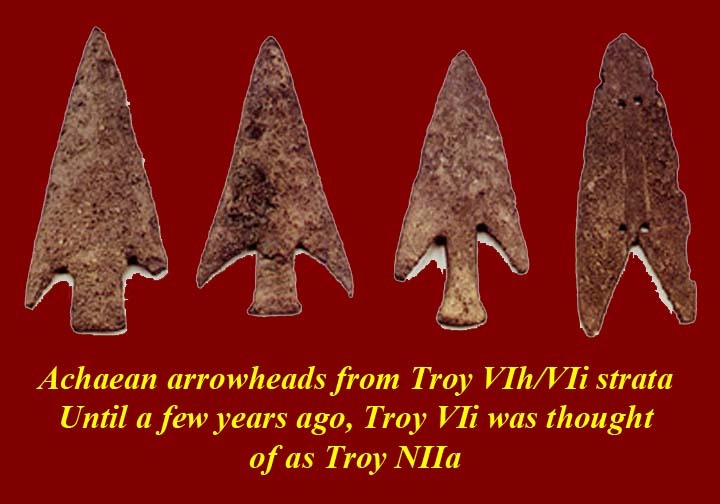 The Hittites, who dominated central Asia Minor (Turkey/Anatolia) an were sometimes hegemons of western coastal Asia Minor including Troy, also left evidence that Mycenaeans were present. 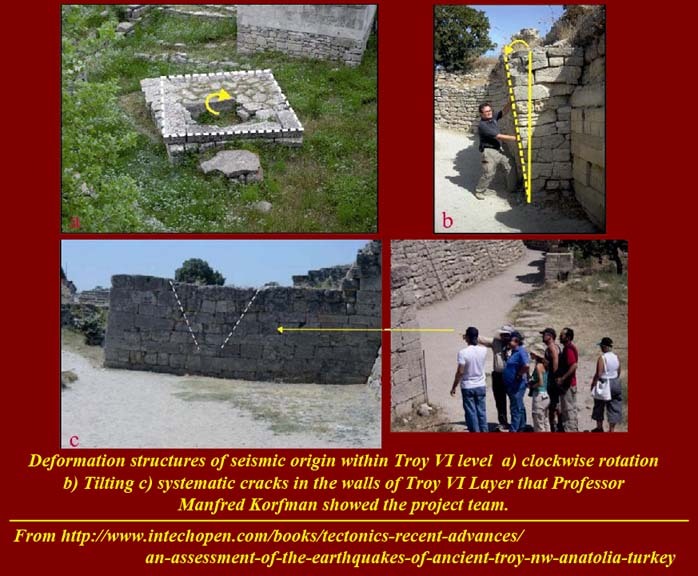 See http://www.academia.edu/219026/Mycenaeans_in_Western_Anatolia for more on Mycenaeans in Anatolia. 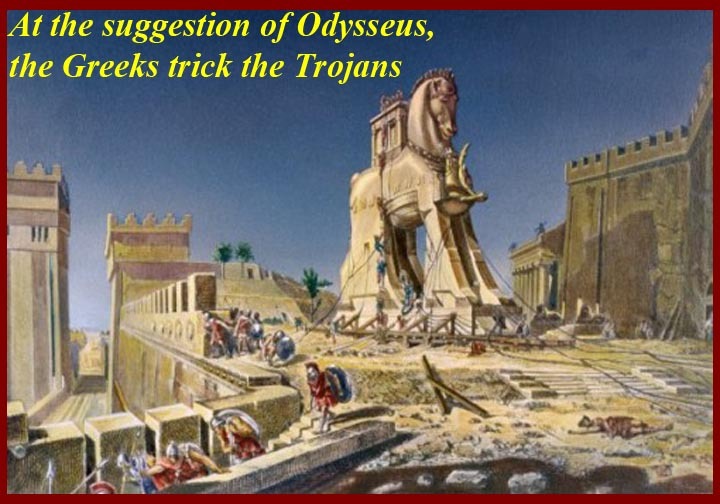 Knowledge of the cause of the Trojan war is widespread in literate western societies. It all began with "the face that launched a thousand ships". Paris accepts the bribe of of Aphrodite and judges her the winner. The bribe is, of course, Helen, an already married woman, with whom he absconds. There is some question in the myths about whether she accompanies him willingly. 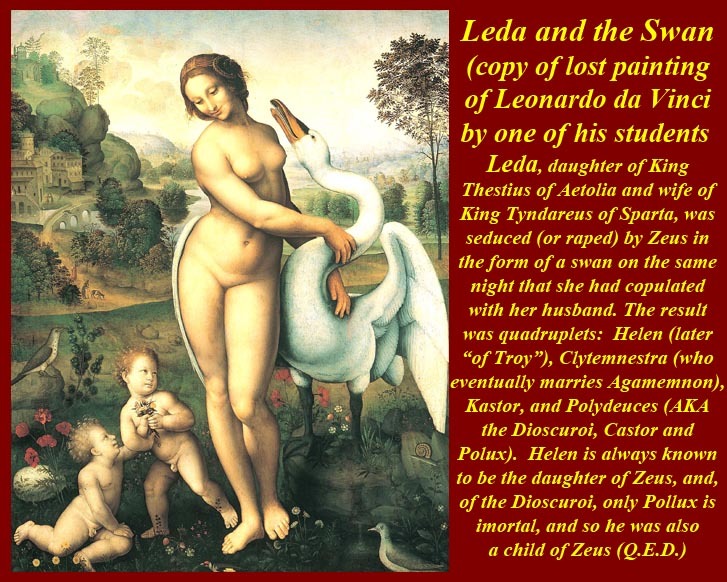 In Greek mythology, Helen of Troy (Greek Ἑλένη Helénē, pronounced [helénɛː]), AKA Helen of Sparta, was the daughter of Zeus and Leda, and was a sister of Castor, Pollux, and Clytemnestra. In Greek myths, she was considered the most beautiful woman in the world. By marriage she was Queen of Laconia, a province within Homeric Greece, the wife of King Menelaus. 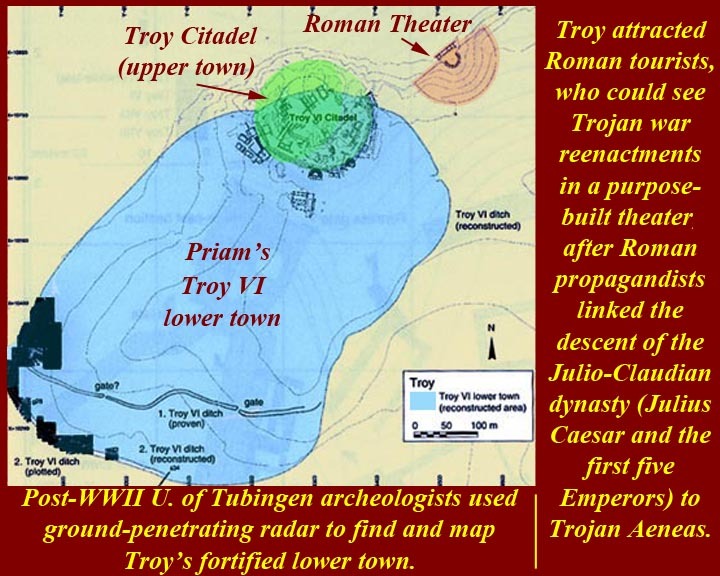 Her abduction by Paris, Prince of Troy, brought about the Trojan War. Elements of her putative biography come from classical authors such as Aristophanes, Cicero, Euripides and Homer (both The Iliad and The Odyssey). 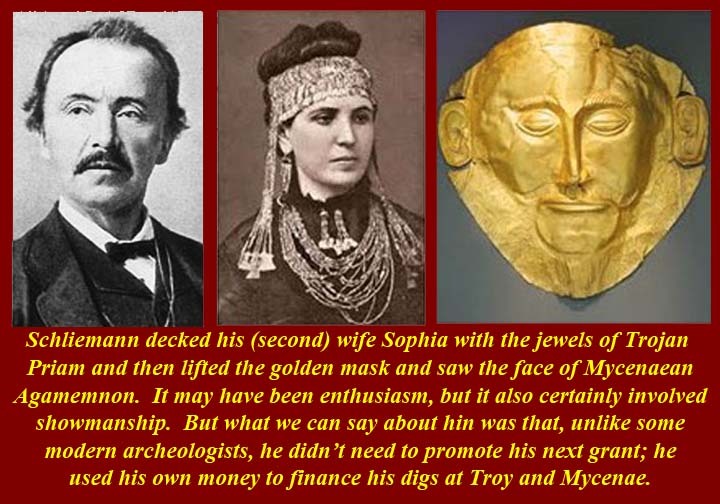 Some modern scholars see the abduction of Helen as an allegoric reference to the fact that Troy was siphoning off Mycenaean profits by imposing tolls and taxes and storage fees on Mycenaean shipping through the Dardanelles (/dɑrdəˈnɛlz/; Turkish: Çanakkale Boğazı, Greek: Δαρδανέλλια, Dardanellia), formerly known as Hellespont (/ˈhɛlɨspɒnt/; Greek: Ἑλλήσποντος, Hellespontos, literally "Sea of Helle"), the narrow strait in northwestern Turkey connecting the Aegean Sea to the Sea of Marmara. The Iliad is all about the anger of Achilles. One has to wonder about how he got to be so volatile. Well he did have a complicated childhood, adolescence, and young manhood. 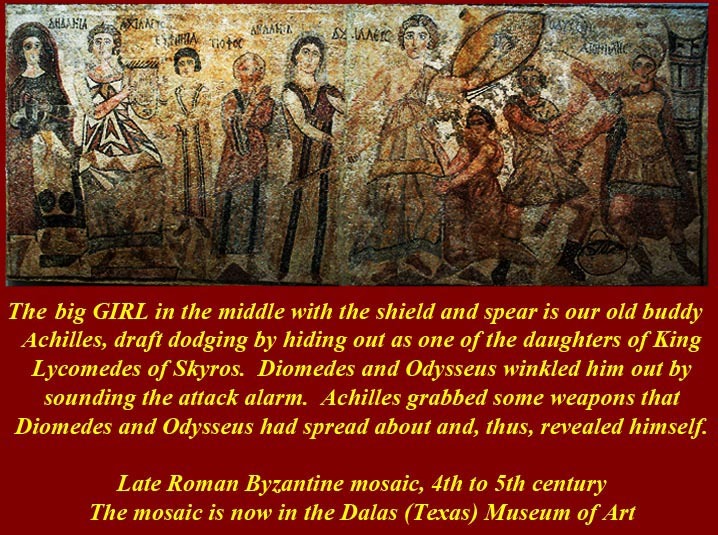 And if having his siblings die off piecemeal and being subjected to Chiron's tutelage wasn't enough, his mother, Thetis, dressed him as a girl and sent him off to live among girls, the daughters of King Lykomedes of Skyros. 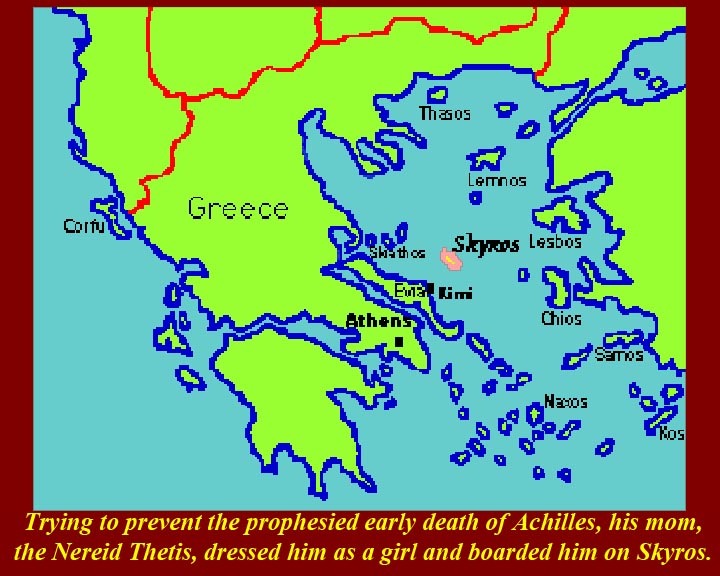 He impregnated the eldest daughter, and then the cross dressing ruse was exposed by a trick of Diomedes and Odysseus, who hauled him off to the war. He probably arrived in Troy already angry. Agamemnon of Mycenae, the "Great King" of the Achaeans, chosen to lead the expedition to retrieve Helen. When the winds prevented the combined fleet from sailing he took the word of a priest, who said he should sacrifice his daughter Iphigenia to placate Artemis, the goddess of the wild and of the hunt (known as Diana in other parts of the Mediterranean). Agamemnon according to the myth had slain a favorite deer of Artemis. 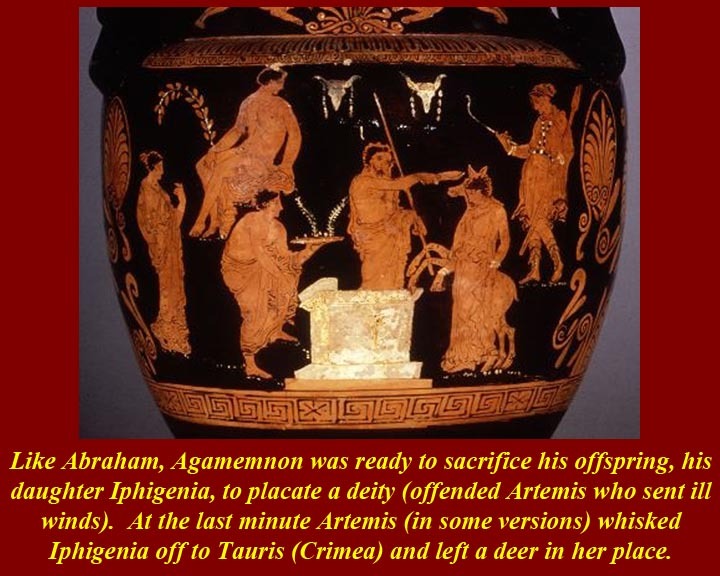 In some versions of the legend, Agamemnon does kill her, but in other versions Artemis takes into account his willingness to do it and at the last instant whisks Iphigenia away to Tauris and replaces her on the altar with a deer. 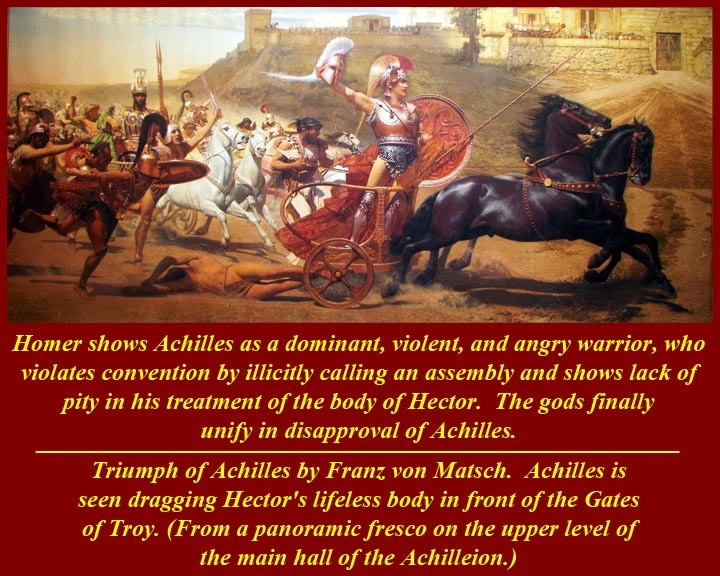 All of this is especially galling to Achilles because Agamemnon had used a supposed wedding if Iphigenia and Achilles to get Iphigenia to come to Aulis where the assembled army had been preparing to embark. Odysseus (Ulysses in Roman myths) and Diomedes undertake undercover, after dark missions against the Trojans and fulfill two of conditions that were prophesied to be necessary for Achaean victory. 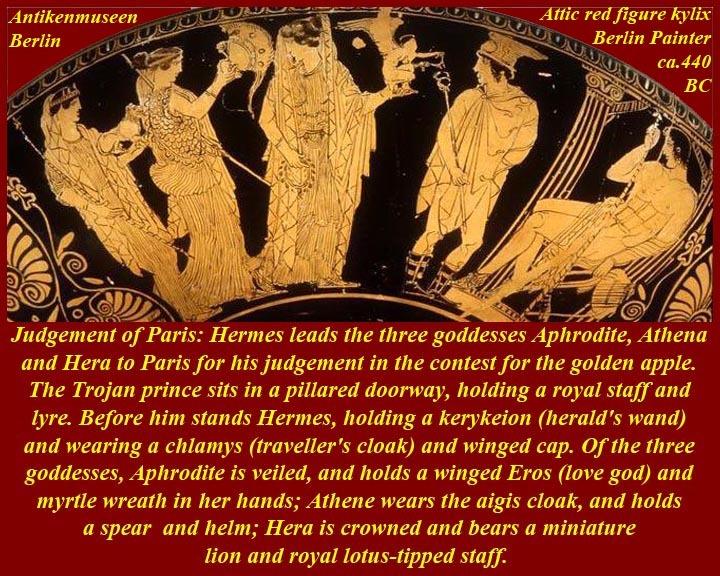 They steal the horses of Trojan ally General Rhesus of Thrace, and they steal the Palladion (an idol of Pallas Athene) from the temple of Athena in Troy. 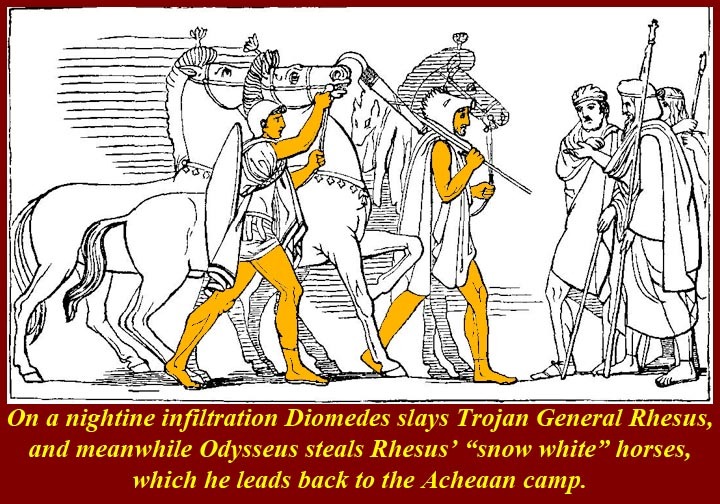 In both the adventures, Diomedes comes off as clever and Odysseus as sneaky. Odysseus is, of course, the protagonist of the Odyssey and the mythical progenitor, through his son Ascanius Julis, of the Roman Julian gens, which included Romulus and Remus. Iris, the rainbow messenger goddess to listen to Hecuba's request for the return of Hector's body; a twelve day truce is arranged for the funeral ceremonies. Achilles, being impious once again, violates the funeral truce by ambushing another son and the youngest daughter of Priam and Hecuba. 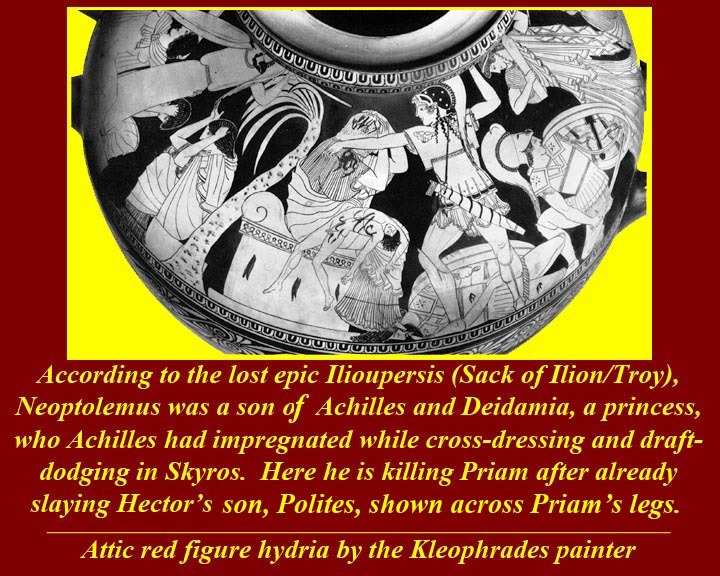 Achilles kills the son, Troilus, and apparently lusts after Polyxena (not mentioned by Homer, but a protagonist in other versions of the story). Priam notices Achilles eying Polyxena and, seeking a way to end the war, proposes a marriage between his daughter and Achilles. Polyxena learns of Achilles week spot on his heel, and she conspires with her brother Paris. 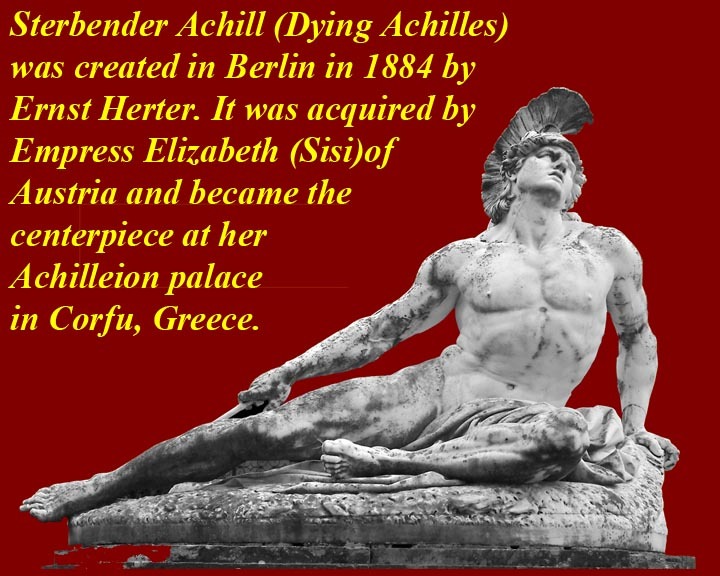 She convinces Achilles to kneel in prayer at the temple of Apollo, exposing Achilles heel to an arrow shot by Paris and guided by Apollo, who, like all the gods, was by this time fed up with Achilles. Achilles dies, and Ajax (the Greater), an old gambling buddy of Achilles, fights off the Trojans who want to desecrate the body of Achilles. 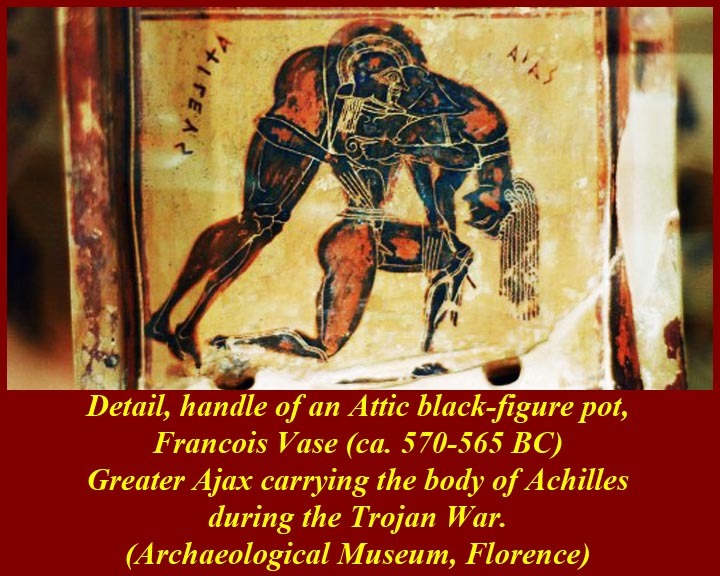 Ajax then carries the body back to the Achaean camp. 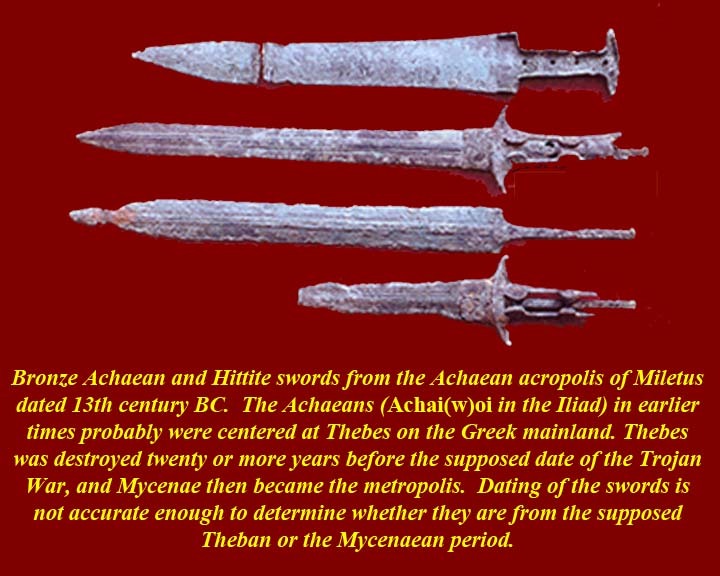 There were two warriors called Ajax in the Achaean forces. The bigger one plays the roll of the big, loyal, lovable, but possibly not to bright friend of Achilles -- and he is the opposite of Achilles in temperament (For those of you who can remember, he's Hoss Cartwright). 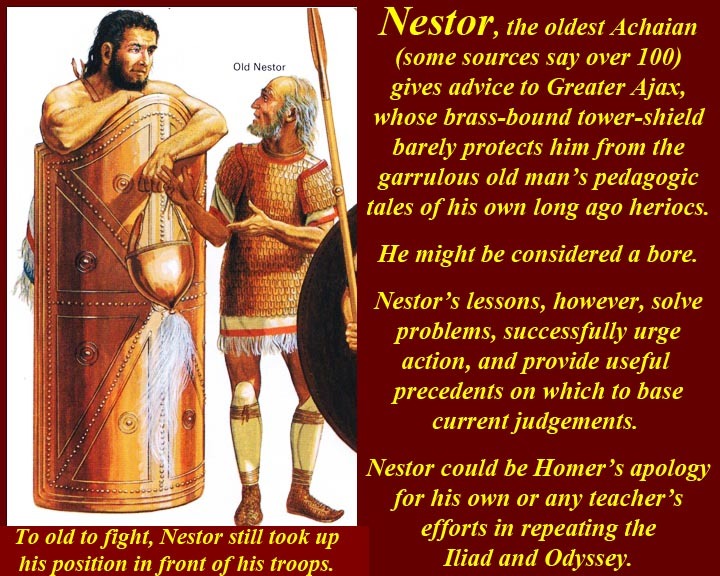 He is mentored by Nestor, the oldest (by a whole generation) and most experienced of the Achaean commanders. 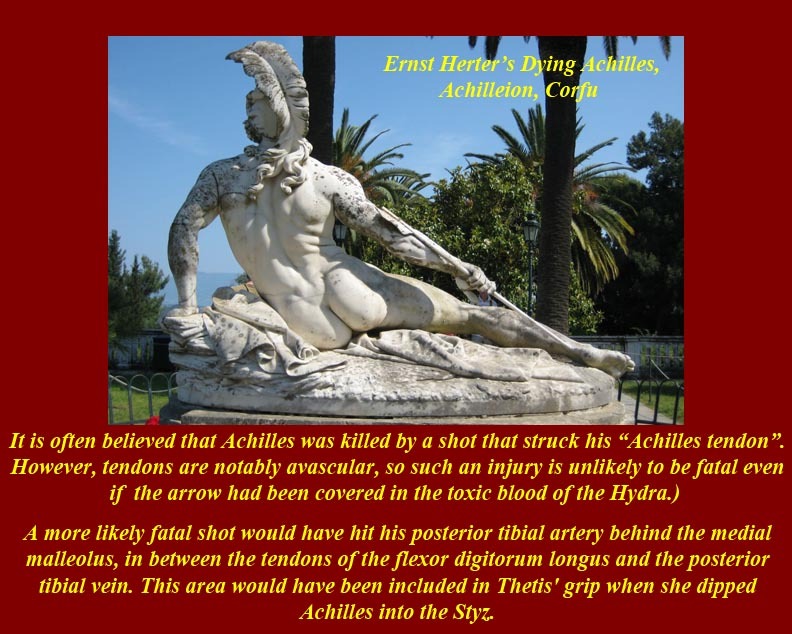 Ajax thought he should be awarded the armor of Achilles; he was, as we have seen, a good buddy of the man and had fought for Achilles' body and had carried it back. 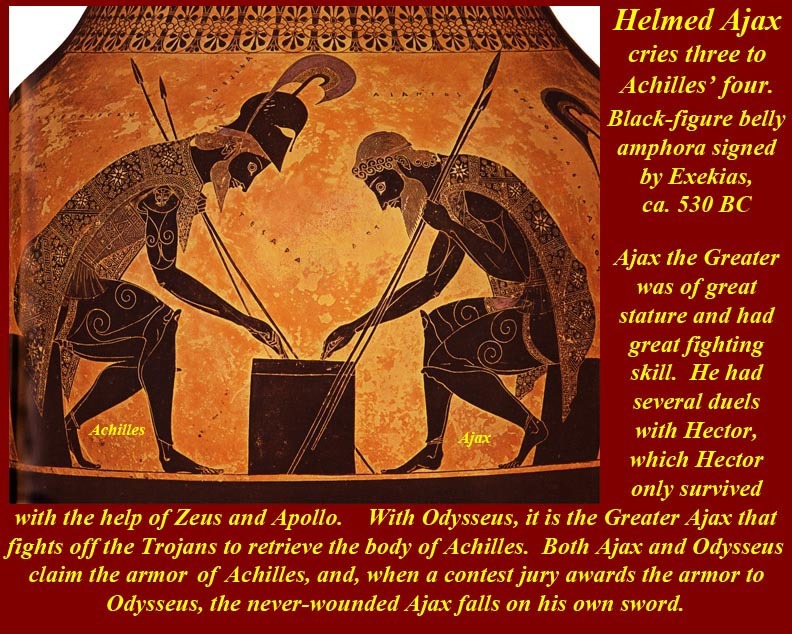 Ajax competed with Odysseus in a speaking contest, and silver tongued Odysseus won the armor. Furious, Ajax cursed Odysseus, which earned the ire of Athena. Athena temporarily made Ajax so mad with grief and anguish that he began killing sheep, thinking them his comrades. After a while, Athena lifted his madness, and Ajax realized that he had actually been killing sheep. 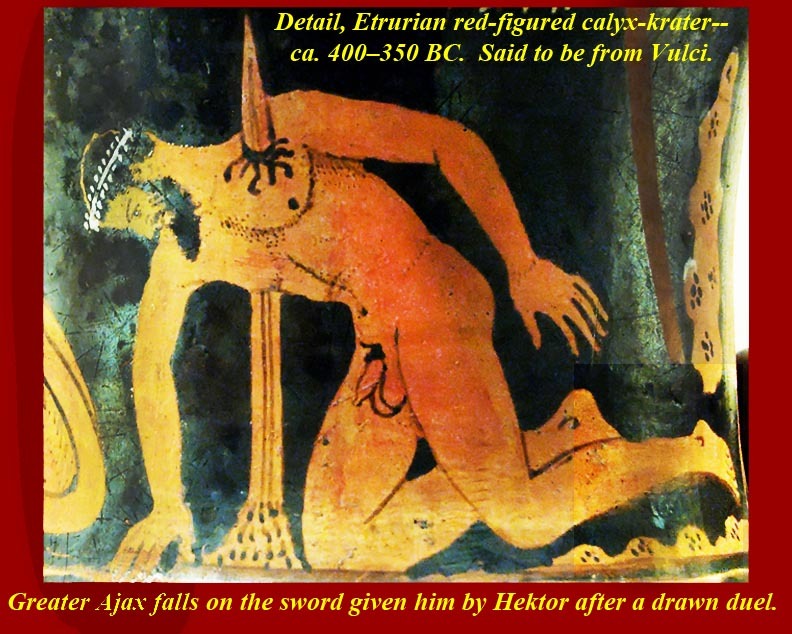 Ajax was left so ashamed that he committed suicide by throwing himself on a sword that Hector had given him on the battlefield after they fought to an exhausted draw. Odysseus eventually gave the armor to Neoptolemus, the son of Achilles. Neoptolemus: the name means "new son of war" -- Achilles was the "old son of war") is portrayed as fighting like a berserker. 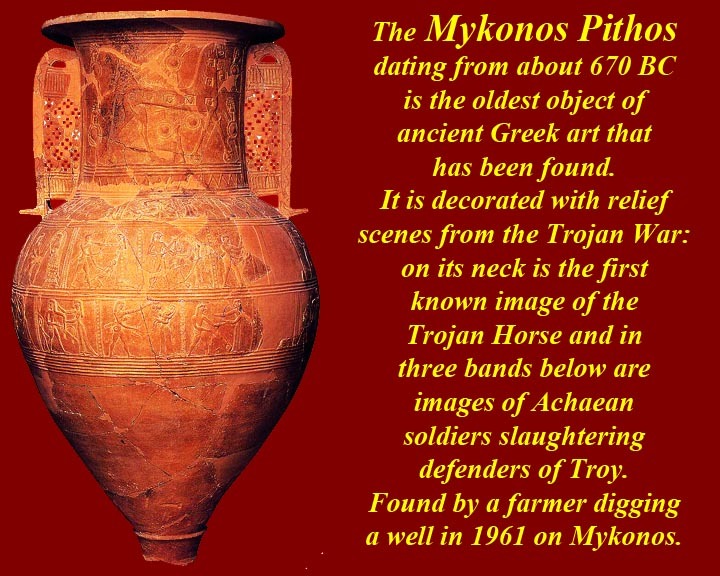 He was also called Pyrrhus (/ˈpɪrəs/; Πύρρος, Purrhos, "red", for his red hair), and was the son of Achilles and the princess Deidamia, and also the mythical progenitor of the ruling dynasty of the Molossians of ancient Epirus. (A later Pyrrhus of Epirus won battles against the Romans from 260-275 BC, but they were "Pyrrhic victories".) 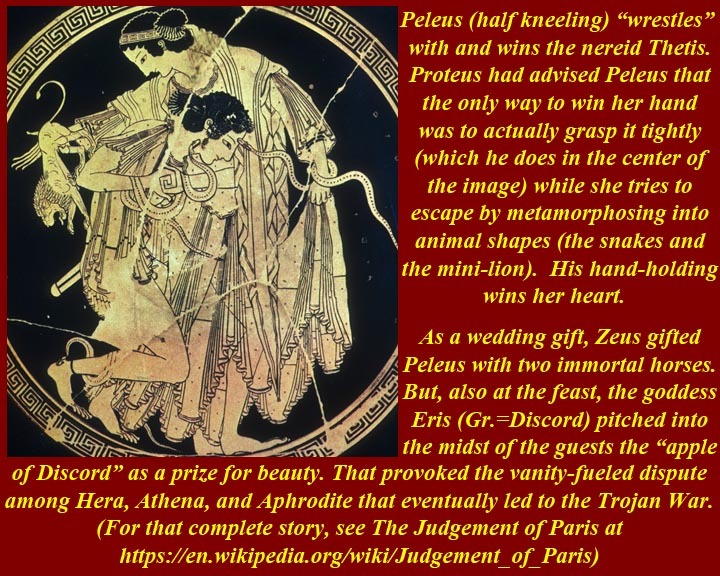 During and after the war, he killed Priam, Eurypylus, Polyxena, Polites and Astyanax, among others, captured Helenus, and made Andromache his concubine. The horse does not appear in the Iliad. 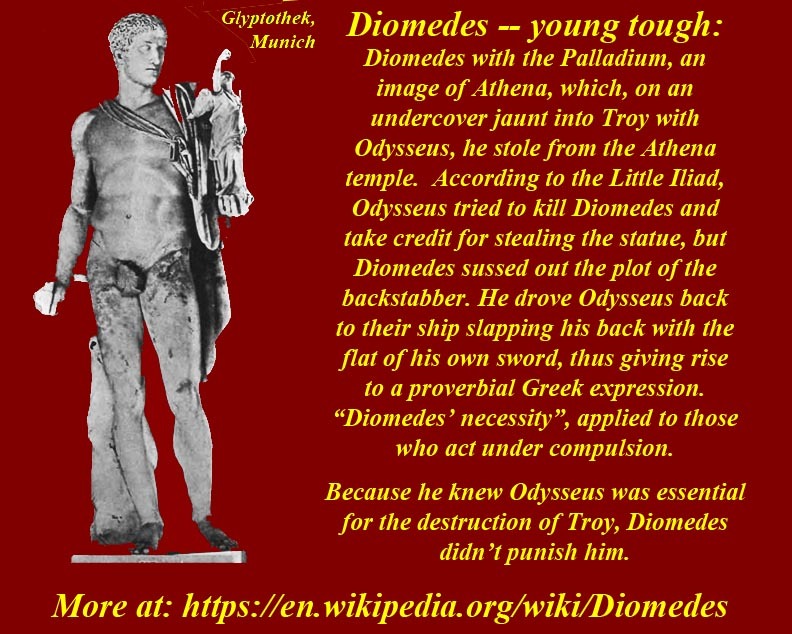 The story is referred to in the Odyssey when Demodocus on the island of Scherie of the Phaeacians is urged by Odysseus to tell the story. The most detailed account of the Trojan Horse is in Virgil's Aeneid, a Latin epic poem from the time of Augustus. 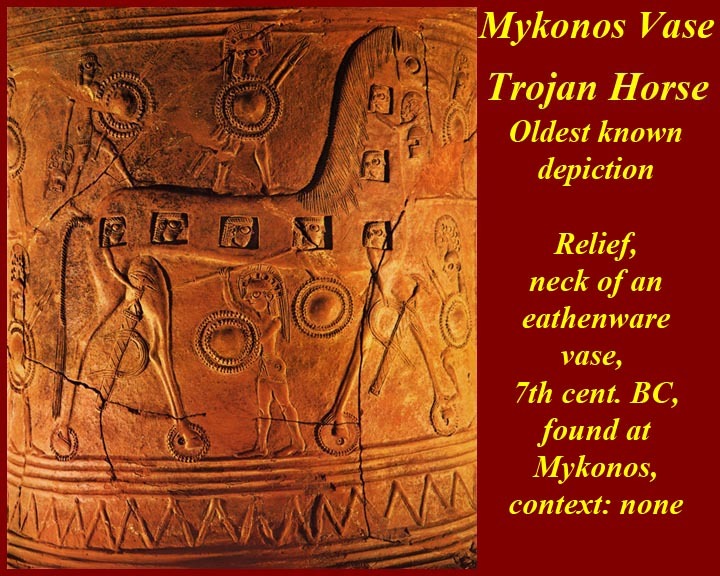 The earliest know example of the Trojan Horse in Greek art is the Mykonos Pithos vase, the neck of which is decorated with a relief of the Trojan Horse Lower relief band on the pithos show Greeks slaughtering Trojans after taking their city. In Greco-Roman mythology, Aeneas (/ɨˈniːəs/; Greek: Αἰνείας, Aineías, possibly derived from Greek αἰνή meaning "praised") was a Trojan hero, the son of the prince Anchises and the goddess Venus (Aphrodite). 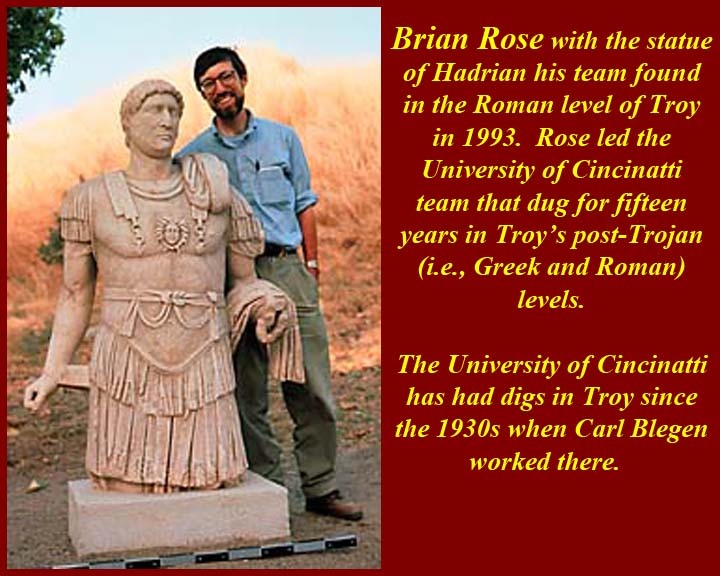 His father was the second cousin of King Priam of Troy, making Aeneas Priam's second cousin, once removed. 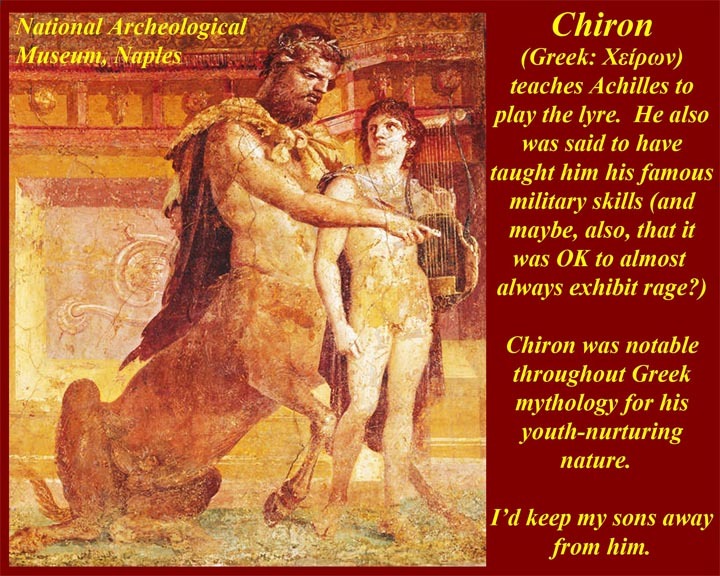 He is a character in Greek mythology and is mentioned in Homer's Iliad. 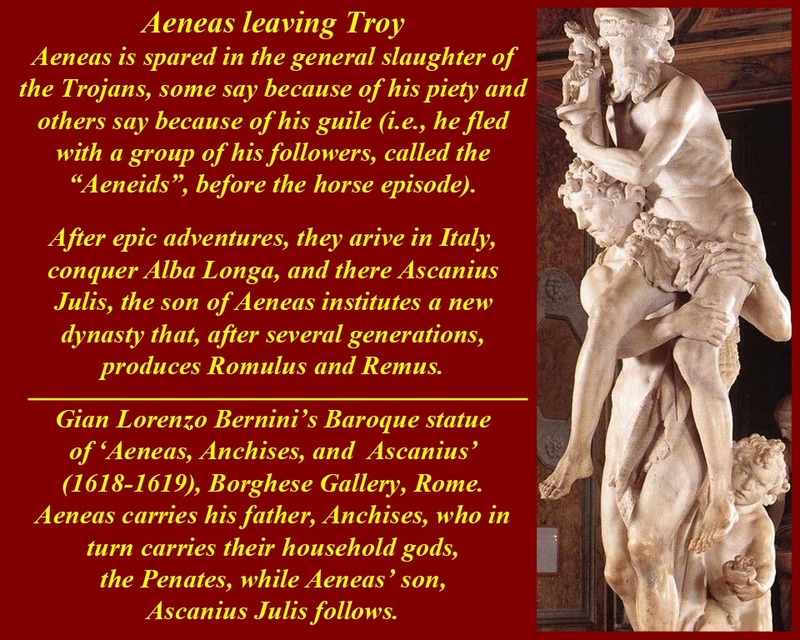 Aeneas receives full treatment in Roman mythology, most extensively in Virgil's Aeneid where he is an ancestor of Romulus and Remus. He became the first true hero of Rome.